Today I'm delighted to be taking part in the blog tour for Holly Martin's new book, One Hundred Proposals with a review. Suzie helps to create perfect proposals every day as part of her job running the.PerfectProposal.com with her best friend, Harry. But while professionally she is great at romance, the same can't be said for her personal life. For the past two years, Suzie has been in love with Harry and, unable to confess her feelings, she has had to watch as Harry dates a string of women. And then Harry comes up with a plan to create more publicity for their business. He will propose to Suzie 100 times in an attempt to find her perfect proposal, documenting the proposal and Suzie's reaction on their blog. Suzie has dreamed of the moment Harry proposes to her, but knowing each one will mean nothing more than a PR stunt for Harry will be torture. As much as Suzie longs to say yes to Harry's question, she has to bottle up her true feelings and go along with his plan. I thought the premise of One Hundred Proposals was fantastic. Imagine being in love with a man and having to endure romantic proposal after romantic proposal without being able to say yes. Poor Suzie has to go through this, pretending she sees Harry as nothing more than a friend and business partner as she can't reveal her love for him as Harry isn't interested in her that way. Harry is a great friend to Suzie and has supported her through some pretty tough times, but he doesn't believe in love and instead hops from one girl to the next, not knowing how much this hurts Suzie. I loved the close bond between Suzie and Harry, how they could have fun but also support each other emotionally. I wanted nothing more than for Suzie to tell Harry how she felt, but could understand her keeping quiet so she didn't potentially ruin their friendship for good. 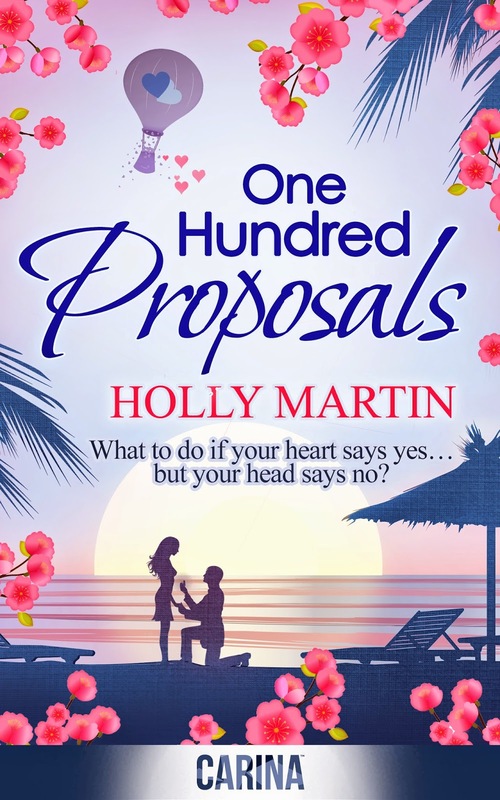 One Hundred Proposals is definitely a fun read that had me giggling straight away, but there is also a serious, emotional side to Holly Martin's writing. Both Suzie and Harry have had a tough time during their lives, which both brings them together to create a tight bond, but Harry's past also keeps them apart. Although the majority of the book is told from Suzie perspective, I liked how we were given a glimpse into Harry's thoughts and feelings through his blog posts about the proposals. There are so many proposals in the book, ranging from small gestures to hugely orchestrated events, but my favourite was the aeroplane proposal which takes place quite early on in the book. It's a fun proposal that, if it happened in real life, I could see being a huge YouTube hit!